Home > Timing Belts MXL-XL-L-H... > H Section Timing belts. 1/2" Pitch Trapezoidal Tooth Gear Belts. H Timing belts. 1/2" Pitch Trapezoidal Tooth Gear Belts. H Section Timing belts have larger teeth then L belts and are generally found in heavy power equipment and tools such as foodservice lifts & equipment, woodworking tools & lathes, printing & sorting machines, pumps, and robotic equipment where heavy duty timing belts are required. "Trapezoidal" is used to describe the squared shape of the tooth profiles. 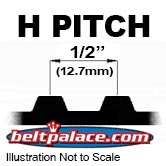 H Series belts are sized by Outer Circumference (Overall Length), Pitch Type, and Width. For example, a 30.0” Circumference “H” belt 1.00” wide would be described “300H100” in Standard or Imperial units (-“100” would represent 1.00” width). A "G" suffix is occasionally used to further identify Neoprene belts (black rubber) and "U" for Polyurethane material (colored plastic). "UG" would designate Polyurethane with Fiberglas cord backing, if applicable. 300H100 Timing Belt - 1 inch Wide, 1/2 inch pitch, 60 Teeth. 300H100 SYNCHRONOUS DRIVE "H" GEAR BELTS - 1" Wide, 60 Teeth. Made for many industrial power transmission applications. Also known as "Synchro-Link" or "Power Grip" 300H100G. Designed for use with office machines, machine tools, postage equipment, sewing machines, vending machines, agriculture, outdoor power equipment, food processing, HVAC, oil fields, wood, paper, sand and gravel applications. • 330H150U Timing Belt. Polyurethane timing belt. 33" Length, 1.5" Wide. 66 Teeth. 330H150U Timing Belt. Polyurethane timing belt. 33" Length, 1.5" Wide. 66 Teeth. Industrial Grade 800H050 Timing Belt. 80.0” Length, 160 teeth, 1/2” Wide. Neoprene HTD 800H-050 Timing belt 800H -050.